For the last few years, the trend du jour in online media has been to demonize, vilify, then shutter the traditional news comment section. Usually these closures come with all manner of disingenuous nonsense about how websites are banning comments for the sake of "building relationships" or because the website in question just "really loves conversation." Usually, on-site users are then shoved toward social media silos at Twitter and Facebook we're told are "just as good" as an active, on-site community (read: doing this is cheaper and makes it somebody else's problem). Traditionally, readers of these websites are told that news comments simply had to die because it's impossible to cultivate healthy discourse in the post-truth, mega-troll era. But as Techdirt and countless other websites have made clear for more than a decade, that's simply not true. And while being lazy, cheap and actively hostile to on-site community is any website's prerogative, this ignores the fact that online news comments are an excellent avenue for transparency and a tool to hold websites, and authors, accountable. With so many websites muzzling community speech because they just so adore conversation, it's good to point out when websites swim upstream against this trend. For example the Intercept last month announced that the news outlet would be partnering with the The Coral Project at Mozilla to make their news comments system better via a myriad of changes to their commenting platform. The Coral Project interviewed some 300 individuals from 150 newsrooms in 30 countries as part of an effort to improve online discourse. Informed by this research, The Intercept's changes include the ability to mute annoying users, the ability to track comment edits, a new offensive comment reporting feature, the "featuring" of exceptional comments by website staff, and the expanded ability of staff to interact with users that pose particularly important questions. Again, none of this is particularly revolutionary. Most of it involves treating readers like human beings. But in this day and age -- doing so is apparently now a revolutionary act. "Journalists often tout their responsibility to hold the powerful accountable. Comments are a way to hold journalists themselves accountable. Unlike posts on social media, comments occupy the same space as the stories and travel with them as they’re shared across platforms. Comments also make it possible for people to share their reactions without having to connect them to a social media account. That’s why we continue to be strong proponents of comments and encourage our colleagues at The Intercept to read (and respond to) them." Again, for better or worse news in the modern era is a conversation. Muting your on-site audience may feel good to editors on tight budgets, tired of trolls, and wistful for the bygone days of carefully-chosen letters to the editor, but it's doing your community (and the news industry at large) a disservice. As such, the Intercept's moves are a welcome change of pace for an industry that has spent the last few years insisting that muzzling your readership somehow represents a breathless dedication to quality online discourse. g0v believes that current online participation tools like social media outlets and online message boards fell short in creating offline action or collaboration. g0v places itself at the center of open-sourced, hands-on, and public-spirited activism with a desire to engage citizens to create real social change. g0v's work is proving that open-source communities can successfully open up and improve government. Ideologically, g0v does not believe that its activism needs to create an enemy out of government, but rather that everyone -- the government and the people -- wins when creative solutions improve existing public structures. The post goes on to describe g0v's hackathons, its first conference, and the Open Political Donation Project. This brought together 9,000 volunteers to digitize 300,000 political donation records as a pointed response to Taiwan's old Campaign Donation Act of 2004, which allowed the public access to campaign donation documents, but only as a paper copy, or in person at a government office. g0v's brand of activism is about making sure government does its job better. g0v explains on its website, it substituted the "o" in gov for a "0" to change the way we see government working. Through civic tech, hacktivism, and a belief that government can and should work, g0v is already showing that it can change the way that government sees itself and the way that people can interact with their government. The Bureau of International Information Programs is supposed to be the leading edge for the State Department's public relations front, as John Hudson points out in his article for Foreign Policy. The IG report stings -- especially because the Bureau of International Information and Programs is supposed to be Foggy Bottom's epicenter of online savvy. The bureau includes groovy-sounding divisions such as the Office of Innovative Engagement, which evangelizes on the "importance of using online engagement to drive offline, person-to-person activities and events." The bureau's stated mission is to be Foggy Bottom's "foreign-facing public diplomacy communications bureau" and supports its "growing social media community that numbers over 22 million followers." An attempt to harness the power of social media through the bureaucratic interworking of 150 agencies is doomed from the start. It makes it very difficult to hone in on a clear strategy and avoid creating a disjointed, inconsistent mess. What makes it impossible is "leadership" that fails to meet even the laxest definition of the word. This is the first thing that greets readers of the report once they scroll past the introductory material, listed as the first item under "Key Judgements." Bureau of International Information Programs (IIP) leadership failed to convey its strategic vision to staff members, despite formalized communications. Leadership created an atmosphere of secrecy, suspicion, and uncertainty. "Secrecy, suspicion and uncertainty" are certainly hallmarks of government leadership. It's never a good thing, but it's certainly much worse when the intended aim is to present a unified and engaging social media presence. According to the report, first flagged by the Diplopundit, overlap and coordination issues trouble the various bureau's 150 social media accounts. The report also mentions a "pervasive perception of cronyism" exacerbating its already "serious morale problem." Cronyism is also a hallmark of government leadership, common enough that this perception will likely never go away. And again, 150 social media accounts, steered by dozens of agencies with no clear guidance, is a recipe for public affairs disaster. Added to the stultifying mix of secrecy, suspicion, uncertainty and a "perception" of cronyism is the crippling banality of bureaucracy, something that takes a straightforward job and turns it into a soul-deadening morass where the left hand doesn't know what the right hand's doing, but both have signed off on it -- in triplicate. There is overlap and a lack of clarity in the functions and responsibilities between the Office of Web Engagement and the Office of Innovative Engagement. Staffing gaps in the latter, coupled with a 15-month vacancy in the director position, have left the office adrift and less able to play its role as the bureau's new technology pioneer. An example of overlap is IIP's 20/100/100 program, which helps 20 embassies at a time raise their social media fan base by 100 percent in 100 days. At the conclusion of an embassy's participation in the program, its social media staff members frequently turn to the Office of Web Engagement rather than the Office of Innovative Engagement for advice. As the number of participating embassies rises with each round of the program, the advising function is shifting to the Office of Web Engagement, drawing staff members away from their primary duties. The Inspector General does a marvelous job attempting to convey the relation and primary of two nearly identically named offices, but it's obvious the staff views the two as interchangeable. Logically, it would seem the Office of Web Engagement would cover, well, web engagement. The IG explains the distinction between the two, but it isn't so much an explanation as it is a statement of "This is for This." It also fails to clarify how an understaffed office that has run without a director for 15 months is supposed to handle the very important (to the BIIP, at least) social media functions. The Office of Innovative Engagement is the proper place for this function for two reasons. First, its mandate is to keep up with the latest changes in social media rules and approaches. Second, it runs the Social Media Hub, the Department's primary repository of this information. In summation, the Inspector General recommends "clarifying the roles, scope and responsibilities" of these two separate, but largely similar offices. It would seem a name change would go a long way towards clearing things up, or better yet, combining the two since everyone's used to going to the wrong place anyway. The staffing issue would be somewhat mitigated and there would actually be someone filling the director position. As is to be expected from the preceding info, the Department's social media "strategy" seems to be the result of staffers being asked to hit targets (see the 20/100/100 program above) but given very little guidance on how to achieve these goals. The actual worth of a "Like" or a Twitter follower is still up for discussion, but you can go a long way towards negating the value of both by placing numbers ahead of engagement. Much of this expense came in the form of paid post promotion, something Facebook makes almost mandatory if you're going to reach the maximum number of "fans." Then again, paying to push it to everyone's feed isn't a guarantee that it will be seen, much less engaged with. Paying for eyeballs also carries with it a faint hint of gaming the system, something both largely ineffective and somewhat morally suspect. Government entities face a much more uphill battle for hearts and minds than commercial entities, considering there's usually no end product to admire and no day-to-day presence in their lives. These entities also tend to view social media as a top-down structure from which they can dump press releases and photo ops onto the masses. This is not unlike government in general which, with the notable exception of campaign season, tends to operate in the same fashion. If these departments are unwilling to engage on a level that actually feels like engagement to the public, chances are achieving "public diplomacy" goals via social media will be next to impossible. "Managing" this with a bureaucractic layers of redundancy only makes things worse. "Social media" isn't "regular media." It has little interest in regurgitating press releases and waiting around until government officials decide it's convenient to "address the media." The "macro" effort might benefit from committees and 68-point "Recommendations" directive, but the "micro" moves too quickly for that. What the Inspector General found concerning the State Department and its use of social media is exactly what anyone should have expected to be discovered. The government is bureaucratic, something that meshes not at all with social media. Paying for "Likes" is the least of the State Department's social media problems. The largest problem is that what's detailed in this report is the natural state of many government entities and it's unlikely to be solved by rearranging the desks and issuing "clarifying" memos. I must admit to something of a minor fascination in how other sites manage their comments. As we've noted many times, we've personally found that keeping our comments pretty wide open fosters the best sorts of discussions in the long run. Yes, like any sites, there are some users who are annoying, and some who exhibit trollish behavior, but most people can get past that pretty quick. In fact, at times, those people (while frustrating initially) can spur some really interesting conversations. One thing we've never quite understood, however, is the attack on anonymity that so many sites insist upon. As we've seen over and over again, many of our most insightful comments have come from anonymous commenters. So I was actually surprised a few years ago when TechCrunch moved to switch all of its comments to Facebook comments, claiming that one of the good things about it was that it required you to provide your real name. Apparently that wasn't actually such a good thing for lots and lots of commenters -- as after nearly two years, TechCrunch has dumped Facebook comments and is pleading for commenters to come back. Our comments are obviously far from perfect, but we've never been at a loss for having spirited discussions on nearly all of our posts. There's just something awesome about the community that likes to really dig into the various stories. That's part of why we've always viewed this site as a discussion site, rather than a "news" or "reporting site." We post stuff with our opinion because we expect people to respond -- good or bad, agree or disagree -- in the comments, and for some sort of discussion to ensue. That doesn't mean that we like to encourage trollish behavior, but we recognize that encouraging a real community has its benefits, and one key aspect to that is keeping the barrier low. Too many other sites seem to think the best way to deal with the messiness of some annoying commenters is to make it more difficult to comment. However, as TechCrunch has discovered, like chemotherapy, it's a solution that can kill off many of the "good" cells along with the "bad." You know, it really wasn't that hard to predict that the brainchild of Rupert and James Murdoch -- an iPad-only news publication, called The Daily, that people would pay for -- would flop. The Murdochs (father and son) don't have a particularly good history of succeeding on the internet. In fact, they have a history that is mostly littered with failure when it comes to internet ventures. But, in an age when ubiquity, availability, access and sharing are what consumers want, coming up with a publication that was locked down, specific to a single platform, and quite limited, just seemed like a bad recipe from the start. We'd already noted that a bunch of the "big name" journalists and staffers that had been brought on to The Daily had been leaving just weeks after the publication launched. But what about readers? While the Murdochs have been quiet, the folks over at Nieman Lab put together a nice proxy, in looking at how many people were Tweeting stories from The Daily's iPad app. I'm sure it's not a perfect correlation, but if people were really engaged with the news from The Daily -- which, increasingly, is an important aspect of news communities, you would expected to see this number continue to go up. Instead, as Joshua Benton describes, it's "decline, plateau, decline." Here's the graphical representation: Again, this almost certainly does not represent a direct correlation to readership. We see stories that gets lots of traffic get very few tweets or comments, and stories with relatively little traffic get a ton of comments. But, on the whole, as an overall proxy, it at least suggests something not good is going on at The Daily in terms of actually getting readers engaged. And, I think, that's the obvious problem the Murdochs always run into with their online efforts. They're good at producing content. They're dreadful at actually engaging with a community. They bought MySpace, but their failure to understand what people there wanted resulted in its rather massive decline. 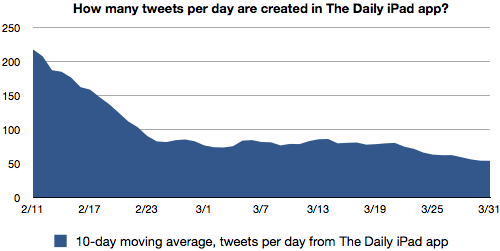 It seems clear, with the Daily, that engagement and interacting were an afterthought. At best, it was a "let them tweet!" sort of discussion, rather than a look at how to actually engage the community in any meaningful way. We've pointed out over and over again that one of the main things that legacy newspapers get wrong today is this idea that they're in the "news" business, rather than the "community" business. They've always been in the community business, and then they take that community -- which they build up around news -- and sell their attention to advertisers. The problem, which much of the industry is facing, is that they're no longer the only game in town when it comes to the community stuff. But rather than recognize that and improve their community efforts and features, many newspapers seem to be going in the other direction: putting up paywalls and avoiding the community. For example, Mathew Ingram got his hands on the official "social media policy" of the Toronto Star newspaper, in which the paper tells its staff not to engage with readers online, for fear that this might be a sign of "bias." As well, journalists should refrain from debating issues within the Star�s online comments forum to avoid any suggestion that they may be biased in their reporting. Seriously. This is a classic example of what journalism professor Jay Rosen refers to as "the view from nowhere," in which a media property spends so much effort trying to make sure that no one thinks it actually has an opinion on anything, that it won't even step in to clear up what's factual and what's not. Too many news organizations feel the need to "present both sides of the story," as if because there are two sides, they're equally balanced, and presenting them both as equal is the equivalent of "objective reporting." It's not. It's inherently biasing whatever side is not being truthful or accurate. In such cases, the press, while hiding behind a claim of being "objective," is really biased in that it's giving undue support to factually incorrect or misleading arguments. Furthermore, pretending that your staff doesn't actually have an opinion makes them seem robotic and less human. I understand why people value "objective reporting," but pretending someone doesn't have an opinion doesn't make the reporting any more objective than having the reporter clearly state what that opinion might be. Beyond letting people calibrate the rest of that reporter's coverage, it actually shows that the reporter is human and makes them more able to connect with fans. But apparently, that's not what the Toronto Star wants. Of course, even worse than these bad social media policies is the Toronto Star's response to the leak and Ingram's story about their policies. The paper's spokesperson, Bob Hepburn, told Ingram that the policy was fine because it is "well in line with what mainstream media organizations have always done. We've always placed some limitations on journalists in terms of them expressing their opinions, either in the newspaper or outside of the newspaper." I've heard people say that, "if someone tells you a deal term must remain because it's 'standard,' it means they don't understand why it's there either." That seems to be the Toronto Star's response here. Yes, we have braindead, shortsighted and self-defeating social media policies that do more harm than good... but it's okay because they're the same braindead, shortsighted and self-defeating social media policies most of our competitors have. Now there's a standard of excellence to strive for: let's make sure we make the same mistakes everyone else makes. A few weeks ago, we mentioned an experiment that we were doing, to try to create more useful and engaging ad products, specifically with a "conversational" ad unit on the front page of the site. The initial ad centered on a discussion of ways in which kids could use tablet computers (the ad and post were sponsored by ASUS and Microsoft). We're running another experiment now. On the article page for this post, or on the front page of Techdirt right after the first post (if you don't run an ad blocker), we have an ad unit that asks for your input on the question of what kinds of computing activities might best develop kids creativity. It shows my answer and asks you to "vote" for one of four activities and then allows to type in a more complete answer -- all from within the unit (so it's not taking you to some other page). This is very much an experiment, and we already learned some things from the first pass at this (some stuff worked, some didn't), and we'll be doing some more as well. In order to keep the feedback in that ad unit, I've disabled comments on this post. This post should also be considered sponsored by ASUS Windows Slate, in partnership with Microsoft and SAYMedia. Following on our recent post discussing Clay Shirky's views concerning social media's role in helping to politicize people who were formerly not all that interested in politics, Shocklee points us to news of a recent study that has found, indeed, that high school students who use the internet to research key interests "were more likely to become involved in 'civic and political issues.'" And it appears that this greater involvement goes beyond just posting about it online, but really becoming more involved in certain causes. This seems to counter the claims of some that online interest in civil and political issues is more just people screaming in front of their computers. It actually does seem to have a real impact. I've occasionally gotten into debates with Techdirt critics on Twitter, and I'll admit the medium is not all that well-suited for thoughtful debate. But, I have found that it is often a good way to, at least, better understand why someone might be upset about something we said or did, and to perhaps try to address it in some other manner (a separate blog post, email, etc.). Of course, it's certainly possible to do a bad job of engaging someone via Twitter, but it seems like a bit of a stretch to say that it's a mistake to respond to criticism. Yet, it appears that's what the Washington Post did. It had published a rather ridiculous story from an "anti-gay activist" implying that being gay is a mental health issue, touching on a few recent stories of suicides by several teenagers who were, in some manner, bullied for their homosexuality. Not surprisingly, a gay activist group, GLAAD, complained on Twitter about the article. Even as we encourage everyone in the newsroom to embrace social media and relevant tools, it is absolutely vital to remember that the purpose of these Post branded accounts is to use them as a platform to promote news, bring in user generated content and increase audience engagement with Post content. No branded Post accounts should be used to answer critics and speak on behalf of the Post, just as you should follow our normal journalistic guidelines in not using your personal social media accounts to speak on behalf of the Post. Perhaps it would be useful to think of the issue this way: when we write a story, our readers are free to respond and we provide them a venue to do so. We sometimes engage them in a private verbal conversation, but once we enter a debate personally through social media, this would be equivalent to allowing a reader to write a letter to the editor--and then publishing a rebuttal by the reporter. It's something we don't do. Now, this raises some questions. First of all, if part of the purpose is to increase audience engagement, doesn't that involve... um... engaging? It seems weird to suggest the way to increase user engagement is to avoid engaging. On top of that, the second paragraph just has me shaking my head. Why wouldn't a newspaper let a reporter publish a rebuttal? Isn't that what engagement is about? The search for "truth" comes from discussing things with different viewpoints, and it seems like something of a massive cop-out for the Washington Post to say that it will refrain from engaging with those who question its reporting.